Not all food is good for our brains. The Western diet of certain foods, in particular, has a negative impact on brain health and memory, and this increases your risk of cognitive decline, dementia, and Alzheimer’s disease. In this article, we’ll examine 11 of the worst foods for brain health. Your brain is vital to the function of your body. The brain is responsible for maintaining blood pressure, keeping the heart beating and the lungs breathing, releasing hormones, and interpreting everything from sound and light to pain. Basically, there isn’t anything your brain doesn’t do. That is why the brain requires its own fuel for optimal function. The brain needs healthy fats such as omega-3 fatty acids; organic and unprocessed foods like vegetables, fruit, and clean meats; and foods high in key nutrients and antioxidants like zinc and vitamins A, C, and E.
Unfortunately, these aren’t staple foods in the modern Western diet, which seems to be increasingly full of the worst foods for Alzheimer’s disease and dementia. Alzheimer’s disease is already the sixth-leading cause of death in the U.S. At this time, it affects more than 5 million Americans, but by 2050, this number may reach as high as 16 million. A study published in the Journal of the American College of Nutrition in 2016 connected a Western diet heavy on sweets, meat, and high-fat foods with higher Alzheimer’s disease levels. In the study that included 10 countries, U.S. residents overall had a four percent chance of developing Alzheimer’s disease. It was also interesting that when Japan’s traditional diet shifted more toward a Western diet, Alzheimer’s disease rates increased from one percent in 1985 to seven percent in 2008. It is clear that certain foods increase Alzheimer’s disease risk. When you remove the following foods from your diet and move away from the Western diet, this drastically lowers your risk of Alzheimer’s disease and dementia and changes your health overall. Sugary drinks are among the worst foods for dementia and brain health. This includes soda, energy drinks, sports drinks, and fruit juices. 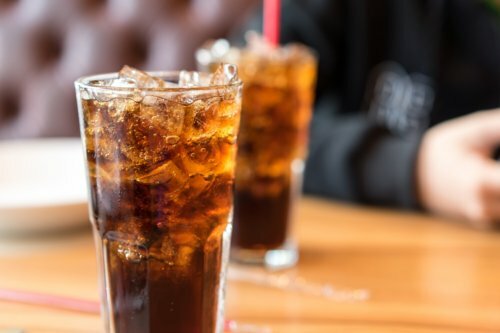 A study published in the journal Alzheimer’s & Dementia in 2017 found that drinking sugary drinks is linked to early signs of Alzheimer’s disease. For the study, the researchers used data on more than 4,000 people over age 30, while examining their brains with MRI (magnetic resonance imaging) scans, and measured memory with memory tests. The researchers found that the more sugar drinks consumed, the lower the total brain volume and the lower the scores on memory tests. Brain shrinkage in general is linked to an increased Alzheimer’s disease risk. Another 2017 study found that people drinking at least one diet soda daily were almost three times as likely to develop dementia. For the study, the researchers monitored the volunteers for 10 years while looking for evidence of dementia in 1,484 participants over the age of 60. A high intake of sugary drinks also demonstrates the link between type 2 diabetes and Alzheimer’s disease. There is a link between diabetes and dementia overall. The higher blood sugar levels can lead to an increased dementia risk, even in those without a diabetes diagnosis. A new study published in the journal Diabetologia in January of 2018 found that people with high blood sugar had a faster rate of cognitive decline than those with normal blood sugar levels. In other words, the higher the blood sugar, the greater the risk of cognitive decline. The study followed 5,189 people with high blood sugar over a 10-year period. It is important to note that the high blood sugar hadn’t always given the participants a diagnosis of diabetes. High-fructose corn syrup (HFCS) is the main ingredient in sugary drinks that is often attributed to an increased dementia risk, impaired memory, and greater brain inflammation. One study published in the journal Hippocampus in 2015 showed that the memory and brain inflammation in rats consuming a diet of 11% HFCS was worse than rats consuming a diet of 11% regular sugar. Among the worst foods for Alzheimer’s disease and dementia are refined carbohydrates as a whole. This means staying away from highly processed grains like white flour, pastas, and breads. A study published in the Journal of Alzheimer’s Disease in 2012 found that people 70 and older eating a high-carb diet had nearly four times the risk of cognitive impairment, and the risk also increases with a high-sugar diet. The study also found that people that consume a lot of protein and fat and less carbs were less likely to develop mild cognitive impairment or dementia. Why do carbohydrates affect the brain? Basically, carbohydrates increase glucose and insulin levels rapidly, which causes an increase in blood sugar. Refined carbohydrates will have a high glycemic index (GI), and as a result, the body digests them faster. This causes a spike in blood sugar and insulin levels. In a large quantity, these foods also have a high glycemic load (GL), which is how much a food increases blood sugar based on serving size. Foods with a high GL and a high GI have both been found to impair brain function. The high levels of insulin may damage blood vessels in the brain, and this leads to memory problems. Interestingly, parts of the brains of Alzheimer’s disease patients also become resistant to insulin, which further links diabetes and Alzheimer’s. Mercury is a neurological poison and heavy metal that can be stored long-term in the tissues of animals. Fish are particularly susceptible to mercury accumulation, and can carry more than one million times the concentration of their surrounding water. Fish absorb mercury through their gills. Methyl mercury is also absorbed when larger fish consume smaller fish like plankton. When we eat fish, the mercury will easily cross the blood-brain barrier, and this can lead to dementia and Alzheimer’s disease. Mercury can also spread to the liver and kidneys, and the placenta and fetus in pregnant women. The effects of mercury toxicity include disruption of neurotransmitters and the central nervous system and neurotoxin stimulation, and the result is damaging to the brain. Not all fish are high in mercury. Fish and seafood thought to be low in mercury include herring, Atlantic mackerel, pollock, salmon, rainbow trout, anchovies, smelt, shrimp, oyster, and mussels. Fish and seafood high in mercury may differ based on the country and your local area. As such, it is best to consult with your local food and safety agency to clarify what fish is low and high in mercury levels. Consumption of too much red meat may also increase your risk of Alzheimer’s disease. Studies have shown that populations eating the most meat and other animal products also have the highest Alzheimer’s disease rates. Why may red meat contribute to Alzheimer’s disease and dementia? Diets high in red meat may promote insulin resistance—an Alzheimer’s disease risk factor. Red meat is also high in iron and copper, which, in high amounts, have been linked to oxidative damage in older adults. Iron in particular is needed for the body to prevent muscle weakness, anemia, and chronic fatigue. That being said, too much red meat will increase brain levels of iron. Iron is also better absorbable from red meat than plant-based foods and poultry. As a result, over time, iron will build up in the brain’s gray matter regions, and this can lead to an increased Alzheimer’s disease risk. It is also possible that cooking red meat at high temperatures and for long periods from frying, broiling, or grilling, can increase the formation of AGEs (advanced glycation end products). Preliminary data suggests that higher levels of AGEs in the brain of Alzheimer’s disease patients may promote inflammation and oxidative stress. It is not necessary to eliminate red meat from your diet. However, it is a good idea to be mindful of how much red meat you eat each week. Also, choose the best quality, grass-fed beef. In moderation, alcohol like a glass of red wine can complement a nice meal well. However, when consumed in excess, alcohol can increase your risk of Alzheimer’s disease and dementia. A study published in the journal The Lancet in February of 2018 found that of 57,000 cases of early onset dementia, 57% were related to chronic heavy drinking—defined as over 60 grams (g) of alcohol daily for men and 40 g daily for women. The researchers found that alcohol-use disorders were diagnosed in four percent of women with dementia and 16.5% in men with dementia. Chronic alcohol consumption can also lead to brain volume reduction, and disruption and metabolic changes of neurotransmitters. Alcoholics also often have a B1 deficiency, and this can lead to the brain disorder Wernicke’s encephalopathy, which can develop into Korsakoff’s syndrome. This syndrome can lead to severe brain damage, including confusion and memory loss. Artificial sweeteners like aspartame are found in many sugar-free products like “Equal” and “NutraSweet.” Diabetics or those trying to lose weight often choose aspartame; however, it is also widely linked to cognitive and behavioral problems. A review of the direct and indirect cellular effects of aspartame on the brain published in the European Journal of Clinical Nutrition in 2008 found that aspartame causes neurological and behavioral disturbances. The researchers even propose that excessive aspartame ingestion may be involved in the development of certain mental disorders while also compromising learning and emotional functioning. Another study published in 2012 found that excessive aspartame intake impaired memory and increased oxidative stress in the brains of mice. Other research from 2013 found that long-term aspartame intake can lead to an antioxidant status imbalance in the brain. Aspartame is made of aspartic acid, methanol, and phenylalanine. Phenylalanine in particular will cross the blood-brain barrier, and it may disrupt brain neurotransmitters like serotonin and dopamine. In addition, aspartame is a chemical stressor that may increase the brain’s vulnerability to oxidative stress. AGEs (advanced glycation end products) are chemicals found naturally in the body and in high amounts in red meat, dairy, and foods cooked at high temperatures such as fried foods like French fries. Researchers have found that mice and humans with high AGE levels are more likely to develop problems with mental processes and memory. Research published in the journal Proceedings of the National Academy of Sciences in 2014 had first examined the role of AGEs in mice. The researchers found that the mice eating the least amount of AGEs had the most improved cognitive function. In humans, the researchers studied the diets of 90 healthy people aged 60 or older. People with high-AGE diets fared worst while showing cognitive decline over the nine-month study. Interestingly, the people with high AGE levels in their blood were also more likely to experience insulin resistance, which can lead to a reduction in memory and brain function overall. Mice fed a diet high in AGEs were found to have higher levels of beta amyloid plaques in the brain, in comparison to mice with lower AGE diets. High beta amyloid content in the brain is associated with Alzheimer’s disease. Trans fats are found naturally in animal products like dairy and meat, which are not a big concern. However, trans fats are also widespread in pastries, packaged sweets, shortening, frosting, margarine, fried foods, muffins, store-bought salad dressings, and partially hydrogenated oil like vegetables oils. Studies show that when people consume higher amounts of trans fats, they often have an increased risk for lower brain volume, cognitive decline, poorer memory, and Alzheimer’s disease. Trans fats may also reduce serotonin production in the brain, which also leads to memory loss. The evidence surrounding saturated fat and brain health is mixed. A systematic review published in the Neurobiology of Aging in 2014 found that three observational studies showed a positive link between saturated fat intake and a higher risk of Alzheimer’s disease; however, a fourth study did not show a higher risk. A potential cause for this higher risk is a genetic susceptibility to Alzheimer’s disease, which is caused by the ApoE4 gene. Some people can consume a high-salt diet without ever having high blood pressure. However, a high-salt diet may impact brain health instead. Salt in the form of sodium is especially high in processed foods, such as soy sauce. A high-salt diet is linked to an increased risk of dementia and Alzheimer’s disease. A study published in the journal Nature Neuroscience in January of 2018 found that mice fed a diet very high in salt had a decline in blood flow to the brain, a reduction in cognitive function, and decline in the integrity of blood vessels in the brain. Cognitive impairment from salt appeared to result from signals sent from the gut to the brain by the immune system. In the small intestines of mice, the researchers found that a high-salt diet had prompted an immune response that increased circulating levels of the inflammatory substance known as interleukin-17 (IL-17). High IL-17 levels then set off a chemical response inside the inner linings of the brain’s blood vessels. The blood supply slowed in the memory and learning regions of the brain in the mice fed a high-salt diet. When the high-salt diet ended, the cognitive function in the mice was restored. Aluminum is a neurotoxin at high levels; therefore, it is best to avoid it. Research published in the Journal of Alzheimer’s Disease in 2013 shows that aluminum enters neurons in a similar way to iron. As a result, aluminum accumulation and neurofibrillary damage may lead to Alzheimer’s disease. That is why it is particularly important to avoid heating food in aluminum containers. The heat will release more toxic compounds, which negatively impacts brain health. Conventional vegetables and fruits are coated with neurotoxic agricultural chemicals. It is a good idea to avoid the Environmental Working Group’s Dirty Dozen, which includes spinach, strawberries, nectarines, apples, peaches, pears, cherries, grapes, celery, tomatoes, potatoes, sweet bell peppers, and hot peppers. These foods should be purchased organic. Research shows that people with higher levels of organochlorine pesticides in their blood like dichlorodiphenyldichlorethylene (DDE) have a higher risk of Alzheimer’s disease. DDE increases amyloid precursor protein levels, which provides a possible connection between DDE exposure and Alzheimer’s disease. In general, it is also best to avoid any processed foods since they contain additives, which are also toxic to the brain and nervous system. The bottom line is that your diet definitely has a big impact on your brain. Inflammatory diet patterns high in unhealthy fats, sugary drinks, refined carbohydrates, artificial sweeteners like aspartame, alcohol, red meat, and highly processed foods are linked to brain aging. Other substances in food can be bad for the brain as well. Mercury in fish and seafood can be neurotoxic and damaging to your brain. It is also best to avoid foods in aluminum containers due to the metal’s toxic effects. What foods will benefit your brain health and overall memory? Consider a whole foods diet high in organic fruits and vegetables, wild-caught seafood, poultry, olive oil, nuts, seeds, and red meat on occasion. The diet should also contain plenty of healthy fats like avocado and coconut oil, which provide the brain with ketones as fuel rather than glucose. Can a Tea a Day Keep Dementia Away? Could Mushrooms Prevent Alzheimer’s Disease and Dementia? Mandi, E., “The 7 Worst Foods for Your Brain,” Healthline, January 28, 2018; https://www.healthline.com/nutrition/worst-foods-for-your-brain, last accessed March 13, 2018. “Alzheimer’s Natural Treatment Options & 7 Notable Breakthroughs,” Dr. Axe; https://draxe.com/alzheimers-natural-treatment/, last accessed March 13, 2018. “2017 Alzheimer’s Disease Facts and Figures,” Alzheimer’s Association; https://www.alz.org/facts/, last accessed March 13, 2018. Grant, W.B., “Using Multicountry Ecological and Observational Studies to Determine Dietary Risk Factors for Alzheimer’s Disease,” Journal of the American College of Nutrition, July 2016; 35(5): 476-489, doi: 10.1080/07315724.2016.1161566. Pase, M.P., et al., “Sugary beverage intake and preclinical Alzheimer’s disease in the community,” Alzheimer’s & Dementia, September 2017; 13(9): 955-964, doi: 10.1016/j.jalz.2017.01.024. Pase, M.P., et al., “Sugar- and Artificially Sweetened Beverages and the Risks of Incident Stroke and Dementia,” Stroke, April 24, 2017; 48: 1139-1146, doi: 10.1161/STROKEAHA.116.016027. Zheng, F., et al., “HbA1C, diabetes and cognitive decline: the English Longitudinal Study of Ageing,” Diabetologia, April 2018; 61(4): 839-848, doi: 10.1007/s00125-017-4541-7. Hsu, T.M., et al., “Effects of sucrose and high fructose corn syrup consumption on spatial memory function and hippocampal neuroinflammation in adolescent rats,” Hippocampus, February 2015; 25(2): 227-239, doi: 10.1002/hipo.22368. “Dementia & Diet Matter: These Foods Raise Alzheimer’s Risk,” Dr. Axe; https://draxe.com/foods-raise-alzheimers-risk/, last accessed March 13, 2018. Roberts, R.O., et al., “Relative intake of macronutrients impacts risk of mild cognitive impairment or dementia,” Journal of Alzheimer’s Disease, 2012; 31(2): 329-339, doi: 10.3233/JAD-2012-120862. “Consumption Advice: Making Informed Choices about Fish,” Government of Canada; https://www.canada.ca/en/health-canada/services/food-nutrition/food-safety/chemical-contaminants/environmental-contaminants/mercury/mercury-fish.html, last updated Feb. 3, 2017. “What is Mercury?” Washington University; https://faculty.washington.edu/chudler/merc.html, last accessed March 13, 2018. “Will Limiting Red Meat Help Stave Off Alzheimer’s?” HuffPost, January 6, 2017; https://www.huffingtonpost.com/entry/will-limiting-red-meat-help-stave-off-alzheimers_us_5859a75ee4b014e7c72ed88e, last updated January 24, 2017. Schwarzinger, M., et al., “Contribution of alcohol use disorders to the burden of dementia in France 2008-13: a nationwide retrospective cohort study,” The Lancet, Feb. 2018; 3(3), e124-e132, doi: 10.1016/S2468-2667(18(30022-7. Lieber, M., “Excessive alcohol use linked to early-onset dementia risk,” CNN Health, Feb. 21, 2018; https://www.cnn.com/2018/02/20/health/alcohol-disorder-dementia-risk-study/index.html, last accessed March 13, 2018. Zahr, N.M., et al., “Clinical and pathogogical features of alcohol-related brain damage,” Nature Reviews Neurology, 7, 282-294, April 12, 2011, doi: 10.1038/nrneurol.2011.42. Humphries, P., et al., “Direct and indirect cellular effects of aspartame on the brain,” European Journal of Clinical Nutrition, April 2008; 62(4): 451-462, doi: 10.1038/sj.ejcn.1602866. Abdel-Salam, O.M., et al., “Studies on the effects of aspartame on memory and oxidative stress in brain of mice,” European Review for Medical and Pharmacological Sciences, Dec. 2012; 16(15): 2092-2101, PMID: 23280025. Abhilash, M., et al., “Long-term consumption of aspartame and brain antioxidant defense status,” Drug and Chemical Toxicology, March 2, 2012; 36(2): 135-140, doi: 10.3109/01480545.2012.658403. “Fried Foods Could Be To Blame For Aging and Dementia, Study Says,” HuffPost; https://www.huffingtonpost.com/2014/02/26/fried-foods-alzheimers-_n_4859884.html, last updated Feb. 26, 2014, last accessed March 13, 2018. Cai, W., et al., “Oral glycotoxins are a modifiable cause of dementia and the metabolic syndrome in mice and humans,” Proceedings of the National Academy of Sciences of the United States of America, Feb. 24, 2014, doi: 10.1073/pnas.1316013111. Barnard, N.D., et al., “Saturated and trans fats and dementia: a systematic review,” Neurobiology of Aging, Sept. 2014; 35(2): S65-S73, doi: 10.10106/j.neurobiolaging.2014.02.030. Faraco, G., et al., “Dietary salt promotes neurovascular and cognitive dysfunction through a gut-initiated TH17 response,” Nature Neuroscience, 2018, doi: 10.1038/s41593-017-0059-z. Healy, M., “Even without nudging blood pressure up, high-salt diet hobbles the brain,” Los Angeles Times, Jan. 15, 2018; http://www.latimes.com/science/sciencenow/la-sci-sn-high-salt-cognition-20180115-story.html, last accessed March 13, 2018. Walton, J.R., et al., “Aluminum involvement in the progression of Alzheimer’s disease,” Journal of Alzheimer’s Disease, 2013; 35(1): 7-43, doi: 10.3233/JAD-121909. “EWG’s 2017 Shopper’s Guide to Pesticides in Produce,” Environmental Working Group; https://www.ewg.org/foodnews/dirty_dozen_list.php#.WqhcspPwbaY, last accessed March 13, 2018. Richardson, J.R., et al., “Elevated serum pesticide levels and risk for Alzheimer disease,” JAMA Neurology, March 2014; 71(3): 284-290, doi: 10.1001/jamaneurol.2013.6030.